as we've met a few times I hope you know that when I'm disagreeing with something it's with the best intention and to discuss the topic from various angles. 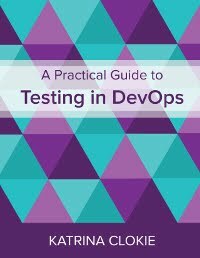 Spoiler: I call myself a tester and a test manager. I found myself nodding to quite a few of your observations. One of the issues I have is that they are Not Even Wrong . Reading through the post I wouldn't want to be perceived as a test manager only by those definitions. And thereby lies one of problems. Labelling a role as test manager or test coach carries judgement. So why should we enforce these labels separating one role from the other? What do we gain? And importantly, what is the harm by attaching one of these labels? Answers on a postcard or even more in-depth. Reading through the post I had a bad bout of ..Huh? ..Really? ..And? ..So? It is presented as fact so is that always the case? Or is it dependent on the company you work at and their perception of what the role should be in their context? (Note: I actually worked in a company as a test manager If someone new to the IT world reads this they won't question a definition like that which gives the wrong impression. The Test Manager / Test Coach summarises the article quite nicely. It does enforce Mutual Exclusivity bias though which, to me, is a problem. It means that a test manager cannot work in Agile cross-teams. It means a test coach has no place in a traditional hierachy. I assume you don't actually wanted to say that but that is how it comes across imo. The role of the test manager has been changing over the last couple of years. Instead of putting up yet another silo, one for test managers and one for coaches I'd rather see a hybrid approach. Maybe in one company it does make sense if the test coach actually has line manager responsibilities and hires new people. Maybe they should have some knowledge of the product being tested to better help and coach testers. Maybe transferring ownership of responsibility of testing away from the test manager to the agile team works well in another company. Hopefully there's some food for thought in my objections. I have seen similar differences but to me that means that we now have the opportunity to decide what works best in the context of the situation we have at our respective companies. Personally I'd like to pick responsibilities and approaches from both descriptions and be off better for it. As per the very first line of the post, there is value for me in making this distinction as I'm about to hire Test Coaches. I think this article will be useful during my recruitment effort. I also mentioned a couple of times in the post that these are observations from my own experience. I don't claim to be defining this for the industry. I just wanted to document what I see and invite comment, such as yours, about what others see. The generally positive reaction that this post has received via social media makes me believe that what I've captured is reflective of the experiences of many people. This is valuable feedback, as it lets me know that my organisation is aligned with others so the skill set that we are looking for should exist in the market. thanks for your reply. What probably hasn't come across is that yes, I also see that there is value in looking for distinctions and as I mentioned we made similar observations, no argument there. Especially as you're looking for that skill set. An observation is looking at the status quo (which is a necessary first step), to me it's interesting how that understanding leads to an improved role that is needed for a particular context. In other words, now that the differences are understood, how do we mix and pick out the best parts? Same as Maaret I've had job titles of 'test manager' while doing test coach tasks. And that's OK too. I'm sorry if my previous comment came out wrong, hopefully this one explains it a bit better. This post intentionally illustrates and highlights differences, but if I were to look around my organisation there are gray areas of overlap too. You asked "how do we mix and pick out the best parts?". I think individuals who are working in test leadership are doing this all the time, in a way that is appropriate to their context. >>>> As per the very first line of the post, there is value for me in making this distinction as I'm about to hire Test Coaches. I think this article will be useful during my recruitment effort. Might be good to highlight that as the purpose of the post (use bold?). It makes more sense in that context. I'll comment on my concerns later. I've held multiple positions of a "test manager" and I've always still been a test coach. I have not had hiring (or firing) power, as in most organizations I've worked in, a test manager is a test project manager and has had similar responsibilities over testing (not testers) as project manager has had over the delivery part of the project. The idea that there could be a growth support only role that provides value is great. You call that a test coach. Others call it test manager (a good manager tends to have coach in them). Thanks for sharing your experiences. They differ to mine, but you've made me wonder whether the reverse of what you've seen can also be true. I'll ask by flipping some of your phrasing. 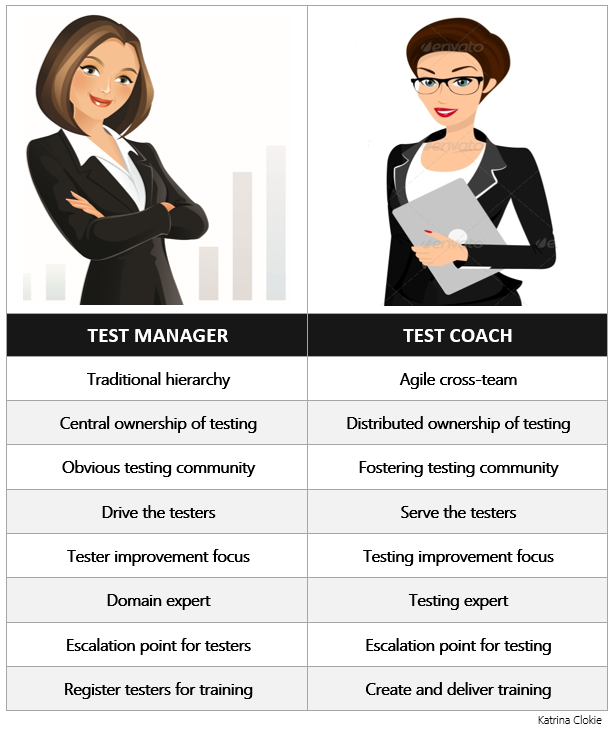 Do you think a "Test Coach" is always still a "Test Manager"? Do you think a good coach tends to have manager in them? Katrina, I praise your effort of defining a role that in my opinion is fundamental for the future of testing and testers. I became a test coach when I found a situation where that was the right answer to the needs of the teams I was serving. A test coach as you are defining it, works extremely well with agile teams, keep up the good work! I really relate to the comparisons you make between roles. A structure change within the company I worked for saw my 'Test Manager' role and responsibilities become more 'Test Coachy'. * A Test Manager is the platoon leader. On the battle front, fighting alongside the troops and working with them to conquer the beach head. * A Test Coach is the quarter master at the barracks, training, equipping, and inspring the troops so they are prepared to take on whatever they faced in the field. I agree with your list of activities and I think it paints a clear distinction between the roles. I hope people don't view a manager as better than a coach, or vice versa. To me they both meet important and different needs within teams. Some situations will call for more coaching, some for more managing. I think an important skill for people in the role, and those who work with them, is to know when the each is needed. I also hope that people don't view one as better than the other. I agree that each role is meeting a different need. It's interesting because it sets a clear distinction between the two. That being said, I'm used to Test managers with no staff responsibility (as Maaret). So in context the actual tasks may swap or merge. And that's how it is. Hi, great thoughts! Being called a testmanager and doing a lot of the above I would always also thrive to be servant manager and also be a test coach. Using your definitions I would think that a good test manager should embrace being a test coach. And as that is a very responsible role, she might need some projectmanagement and or team leading support, just for timing reasons. But the slightly negative touch to your description of testmanagers also clarifies something to me: someone has to do the work you describe, and it is definitely better if a person with some affinity to testing does it. No, I don't agree with your discernments. Not all Test Managers are responsible for hiring their staff; some don't even have direct reports. Test Coach sounds like the fluffy name for Senior Test Analyst. I really liked this blog, I think I can definitely see how this will work and like the clear differentiation between the two roles. Personally I think I would really like to work along side a Test Coach when my role is that of test manager. Often I feel the balancing act between two roles is a struggle and hence I can clearly see the value test coach would bring as it will help share the creative,bouncing off ideas and help creating test solutions to real problems piece of the TM role. Nice thoughts of you. For my until now, Test Manager and Test Coach was the same. Katrina this is brilliant and well-timed for me. I have (and have had) both Director and Manager titles, but they never adequately described the relationship I've had with my fellow testers (I say fellow despite what the org chart shows). I'm very happy to be at a company now that is adamant about supporting independent cross functional product teams, and I constantly reinforce to other testers that while I'm very happy to dispense test-related advice, it is their team that should collectively develop their processes. At times I have a nagging voice that tells me I'm shirking responsibilities doing that, but it feels right. It also encourages testers on these Agile teams to be more than just someone who tests, but to be a team member with equal input. It's a constant challenge to figure out exactly how much to ask if folks need help without feeling like I'm interfering in their team's organic development, but I love it, and getting it right(-er) is valuable and valued. One note: I would hate life if I were in this coaching role but not able to be a decision maker on recruiting and hiring. Having these independent teams doesn't allow me to be an expert on each product, as you point out, and this means I have to be able to get people who are curious and able to communicate with tact and courage, as well as the typical more technical/analytical focused skills. Great write up, and thanks! Excellent post Katrina, thanks for sharing it. It is exactly my experience! My organization has decided to pass to Scrum Agile framework and give me a role of Design Office of Quality Assurance. I've decided to be a Test Coach to better help people of the new teams to approach to the testing in the "Agile way", to improve the quality attention shared on the team not just on the ex-QA members! I'm organizing workshops with all teams members where people will share his experience and give his support to the community, approaching a "Lean Change Management" way to learn. It's really fews days that I'm working in this way and your post is very useful for me, thanks really a lot!